Buyers can contact us if they are looking for supreme quality Stainless Steel Seamless Pipes & Tubes at economical rates. Our company is an ISO 9001:2008 certified company because of which we come up with only premium AISI 314 Stainless Steel Seamless Pipes & Tubes. 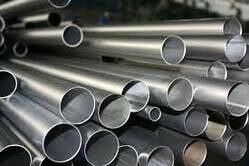 These pipes and tubes are manufactured by our production team with the use of high-grade steel and latest technology. We are widely praised in both national and international markets for providing the supreme quality, easy installation and durable SS Seamless Pipes and Tubes at the best market prices.